Local civil society activists say Guinea's latest political crisis has taken on an ethnic dimension in N’zérékoré – junta leader Moussa Dadis Camara’s home region – which has an ethnically mixed population and has experienced communal clashes before. The 28 September killing of over 150 civilians by security forces in the capital Conakry triggered tension in the southeastern Forest Region. NGOs and local authorities are trying to rein in ethnic dissension and establish dialogue among the various communities in the region. This week the regional capital, the city of N’zérékoré, remained relatively calm but with underlying tensions, residents told IRIN. They said the days ahead would be crucial for maintaining peace. Immediately after the Conakry killings rumours emerged in N’zérékoré that local members of the Peulh ethnic group would demonstrate against Camara and that the Guerzé, the junta leader’s ethnic group, would react violently against anyone participating. On 10 October civil society organizations and religious and traditional leaders held a “day of dialogue”, amid what a report from the meeting called “a national crisis that compromises stability”. "The barbarity we saw cannot be described"
“At the meeting people from the Peulh and Guerzé communities said there was no truth to the rumours,” said Béatrice Kolié, facilitator in conflict resolution with the NGO Réseau de Femmes du Mano pour la Paix (REFMAP). REFMAP and a local traditional communicators’ NGO initiated the meeting, with the support of the NGOs Faisons Ensemble and World Education. After the events of 28 September political conflict took on an ethnic tone in N’zérékoré, Kolié said. Another observer, who requested anonymity, said there is palpable tension between Guerzé and Peulh youths. One day in mid-October some N’zérékoré neighbourhoods were strewn with flyers that read in part: “If Dadis leaves power, the Peulhs leave N’zérékoré”. 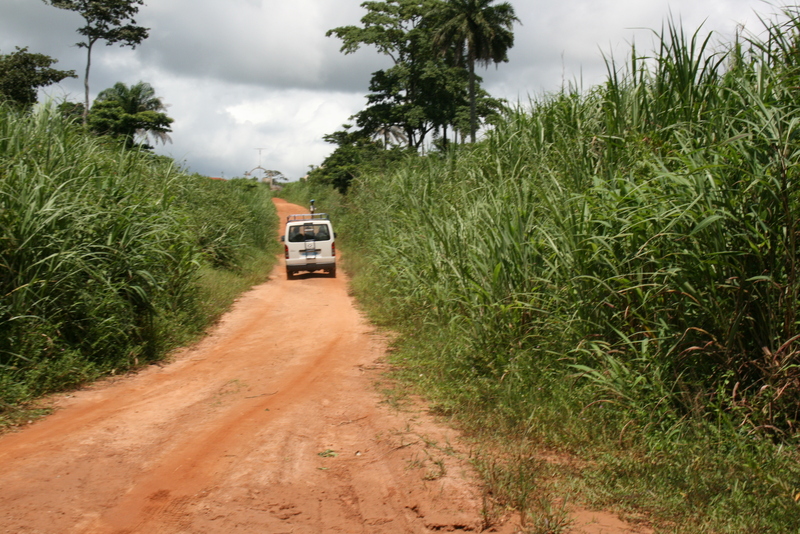 N’zérékoré is no stranger to ethnic tensions: In the past there have been clashes between Malinké and Guerzé. Guinea's ethnic makeup consists of Peulh (a majority at about 40 percent), Malinké, Soussou, and several smaller groups from the Forest Region. From independence in 1958 to the 2008 coup bringing Camara to power, the country had two presidents – one Malinké and one Soussou. Observers say many Peulh think it is “their turn”. Meanwhile Camara supporters are seen as playing on the exclusion of Forest Region ethnic groups, according to International Crisis Group (ICG). “No matter how you look at it, in Guinea the ethnic dimension constitutes a very prominent element in every socio-political aspect,” Mohamed Jalloh, Guinea expert with ICG, told IRIN. One man who said he was beaten by soldiers on 28 September in Conakry told IRIN every soldier he came in contact with asked him his ethnicity. Youths in Conakry said in the following days soldiers harassed and threatened Peulh people. The current defence minister, Sekouba Konaté, has links with rebel and militia groups from Guinea’s and neighbouring Liberia’s recent past, according to ICG, who says in its latest report that the junta is training militias in the southeast. In opening the 10 October meeting in N’zérékoré – after a moment of silence for the 28 September victims – a sage presented 10 kola nuts each to community representatives as a sign of welcome and brotherhood. 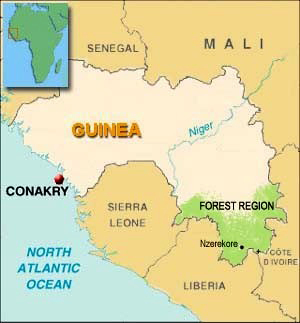 Map of Guinea showing location of Forest Region. Members of several ethnic groups discussed the situation, with traditional and religious leaders reminding participants that they are all part of one Guinea and if the nation suffers, all suffer. A Peulh Islamic leader at the meeting, who has lived in the region for more than 40 years – “in perfect harmony with my Guerzé hosts” – urged participants to work for national unity. The participants also recommend using local radio to defuse rumours, reviving local structures aimed at preventing conflict, holding more dialogue days, organizing youth prayer days, and forming interethnic and religious committees. In another initiative local civil society groups conducted a “peace caravan” in which people gathered and visited representatives of various ethnic communities, to shake hands and talk. One Guerzé man who requested anonymity said ongoing peace-building efforts must immediately be concentrated on the youth, claiming that young Guerzé reject – often violently – the slightest criticism of junta leader Camara. He said he knows a woman market vendor who was recently beaten by some youths for selling goods to Peulhs. ICG in its report expresses concern over inter-communal violence in the region, noting that a top junta official recently on a visit to N’zerekore declared, “Dadis or death”. The Guerzé man told IRIN he was threatened on another occasion when he tried to ease hate talk against the Peulh. “I heard a group of Guerzé youth saying they would have to eliminate some Peulhs to diminish their number in Guinea. After the initial incident I had vowed I would keep quiet, but this disturbed me so much; I just had to say something.” He said he told the youths that hurting or killing Peulh would solve nothing.